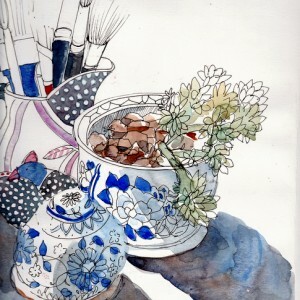 Over the last few years, I’ve been using watercolour for sketching, usually combined with ink. A small travel palette is ideal for adding colour on the spot. 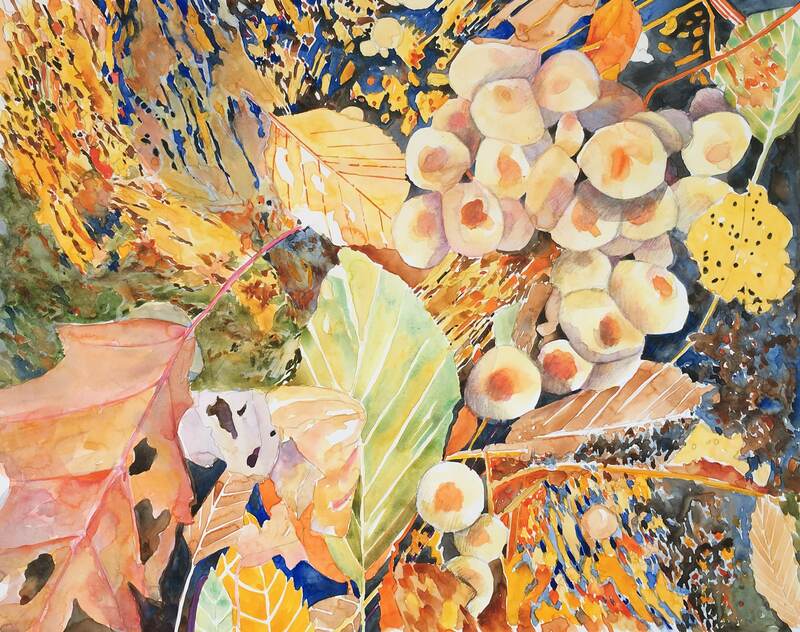 This painting marks a return to watercolour painting on a larger scale in the Studio. 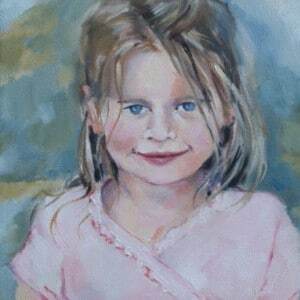 The reference photograph for this painting was taken many years ago while on a family visit to Belgium. We walked a few kilometres from the home and our wandering led us through a forest. I was fascinated that this wonderful place was so close to suburbia. The image hasn’t lost its appeal. While working on the painting, I was right back in the forest; experiencing again the earthy odours of autumn leaves and funghi. The title, The Wrap of a Leaf is from a poem by Dylan Thomas. When I’m looking for a suitable title I will use a “random title selection method” I am amazed how frequently an apt title pops up. On this occasion, I searched my poetry books for the word ‘leaf’ and this line jumped out. I used graphite and coloured pencils in some areas with most of the painting in pure watercolour. Initially, I planned to include collage, adding different painted papers. However, as the work progressed I was content to keep to watercolour. The surface is a full sheet of Stillman & Birn Zeta paper. I enjoy the unpredictable nature of the hot press surface which causes the paint to move and blend in ways different from the usual cold press watercolour paper. Painting this way encourages me to relinquish control.